A while back when I purchased the taxi, the indicator switch was extremely sensitive – which basically meant the left indicator would come on even if you touched the indicator stalk behind the steering wheel. 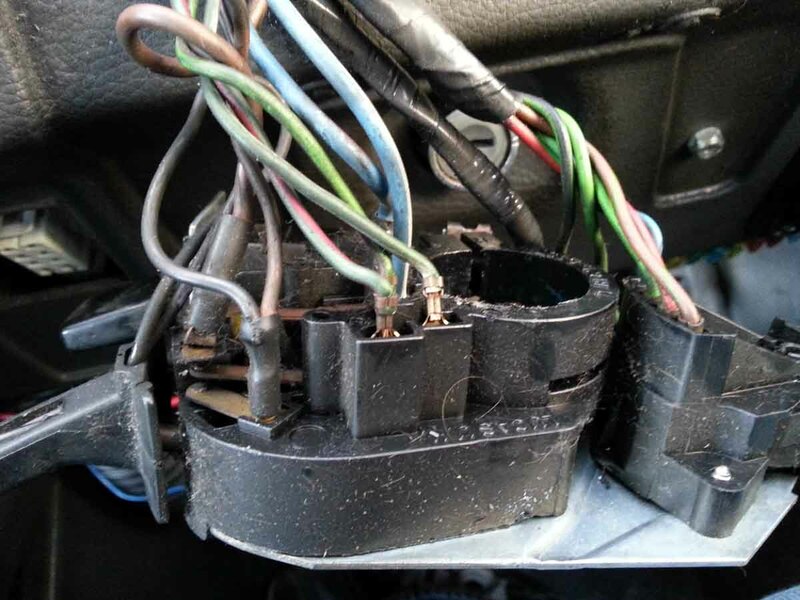 As with most electrical problems in this car, it’s usually down to poor electrical connections caused by water/corrosion/dust etc. To get to the workings of the switches (the wipers, horn, indicators, lights are all on one unit), you’ll need to take off the steering wheel (I believe a 27mm socket), then the two black covers which hide the wiring (a couple of phillips screws). With that, you can access the harness with the switches and stalks on. The whole unit can be taken off the steering column by one more tensioning screw. You might find the wiring to be quite tight when trying to lift it over the end of the column, but there was just enough stretch in mine so I could get it off. Once the unit is free of the steering column, you can get to the offending wires. In this case the left indicator is powered by a connection made through the three green wires in the first photo. I think these connect to a copper plate which touches a similar plate on the end of the stalk (hidden). Through the years, these plates have been coated with dust particles, and the wires have been pushed in past their plastic seating. I removed the three wires, cleaned the connections with some contact cleaner and sandpaper, then reseated them properly. This solved the indicator problem. 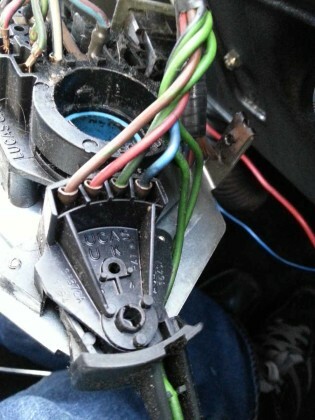 You can also see on the first photo there are some brown wires going to more copper plates – these make the connection for high beam when you pull the indicator stalk toward the steering wheel. This brings the two connections together, however because of the dust it was arcing and burning off all the crud everytime, with small wisps of smoke! Again, I cleaned all of these connections with a bit of sandpaper and contact cleaner and blew the whole unit down with the air compressor. Putting this back together is obviously the reverse of dismantling, however be sure to seat the blue ring (visible in the second photo) correctly on the steering column. A small pin from the steering wheel sits in the blue ring and will disengage the indicators as you exit a corner. Caig DeOxit D5 is the best electrical contact cleaner I have come across, and lasts a surprising amount of time considering most of the taxi has been sprayed with it!